I lost contact with one of the friend of mine for a month or two. and out of suddenly he appear and told me that he feel very pressure and da da da …. Two weeks after that, he said he fall sick and it last for few days. Finally he went n meet a doctor and the doctor said he has high blood pressure. And the doc advice him to take more rest and do not go to work for 2 days! U know what, this friend of mine is only at late twenty. n now high blood pressure seems to attack younger generation now. So guys, dun pressure yourself too much. take more rest and live happily. i still remember the size those baby discus fishes are around 1.5 inch long. The biggest baby discus fish size is around 2 inches. After few weeks i had them, i took some pictures for them. 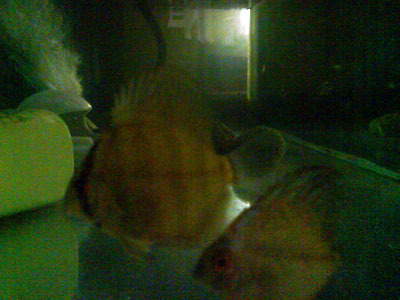 Here’s the pictures of those baby discus fish i took during August 2007.